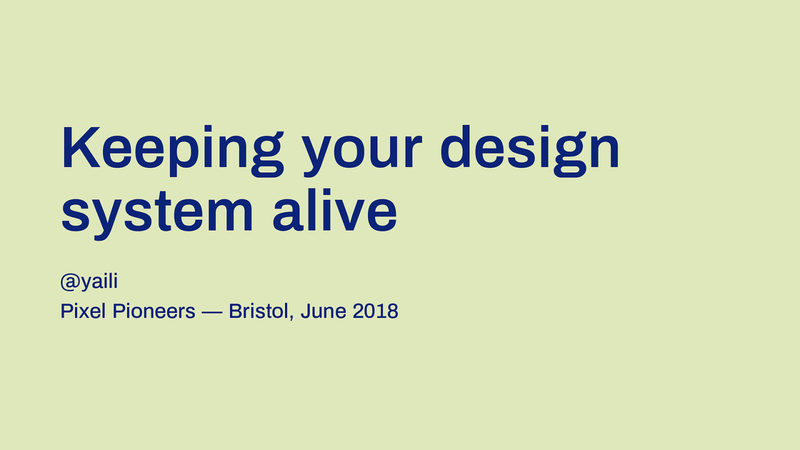 A design system is a system of living principles, guides and components used by designers and developers to build consistent products and experiences. A design system is a product . It has users, roadmaps, releases, features, maintenance, bugs, documentation and support. You’re going to make mistakes. That’s OK.
Learning about Keeping Your Design System Alive with @yaili. I'd love to see more Parks and Rec references at confs. #pixelpioneers the great talk on design system by @yaili comforts me in the idea that we, as designers, need also to understand dev tools like git and documentation if we want to be able to build consistent future proof products. So excited to have made it to @pixelpioneers today! Feeling pretty energised after hearing about @flarup’s journey (also feeling ever so slightly lazy 🤣) and need to find out more about design systems! Thanks @yaili! Relaxing at home and digesting the full day @pixelpioneers. So much input, inspiration - thank you @oliverlindberg for putting it all together and @colly @idaaa @heydonworks @escmum @flarup @WalterStephanie @lorp @yaili for your valuable contributions.